Especially during warm-weather months, it’s common to see our president, Holly Wray, sporting her tennis whites in the office before an after-work match. 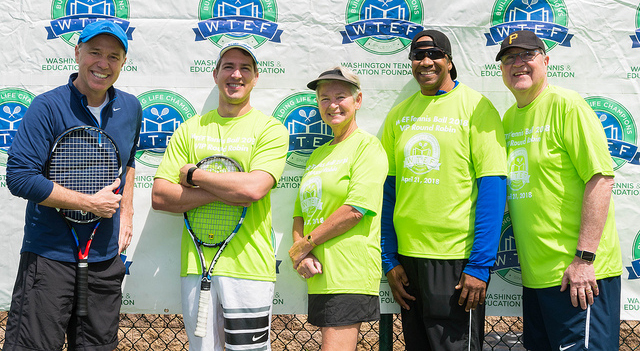 Holly’s love for the sport and Akoya’s work in the Washington, DC, area are what inspired us to support the venerable Washington Tennis & Education Foundation. Since 1955, the nonprofit has built “life champions” by giving underserved kids a safe environment in which they can excel in tennis and academics. Hundreds of children ages two and older participate in WTEF’s afterschool programs and summer camps annually. WTEF’s annual Tennis Ball is something we look forward to each year, and not only are we proud to be a bronze sponsor for the recent gala, we are proud that Team Akoya made it all the way to the finals of the VIP Round Robin Tennis Tournament! Watch out, Roger and Serena! This entry was posted in Community Engagement on May 21, 2018 by Annie Brown. 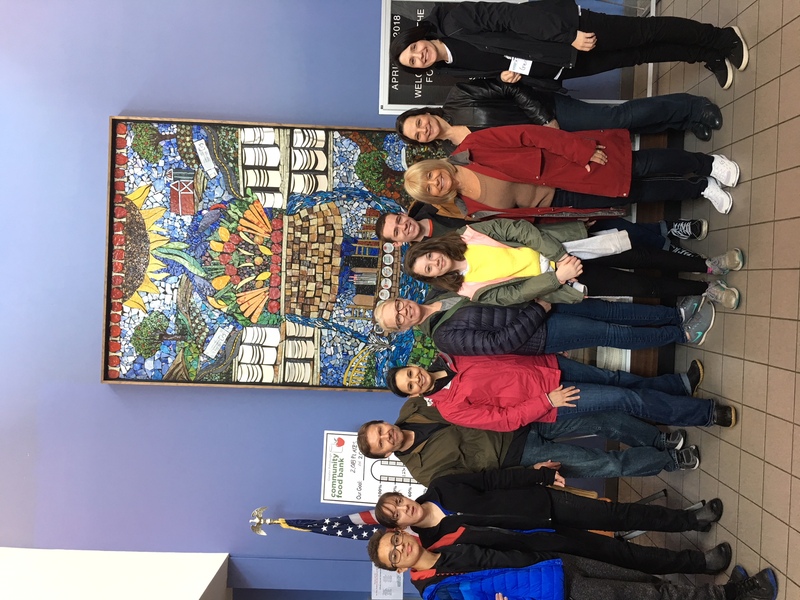 A team of Akoyans and their kids volunteered at Greater Pittsburgh Community Food Bank in early April. 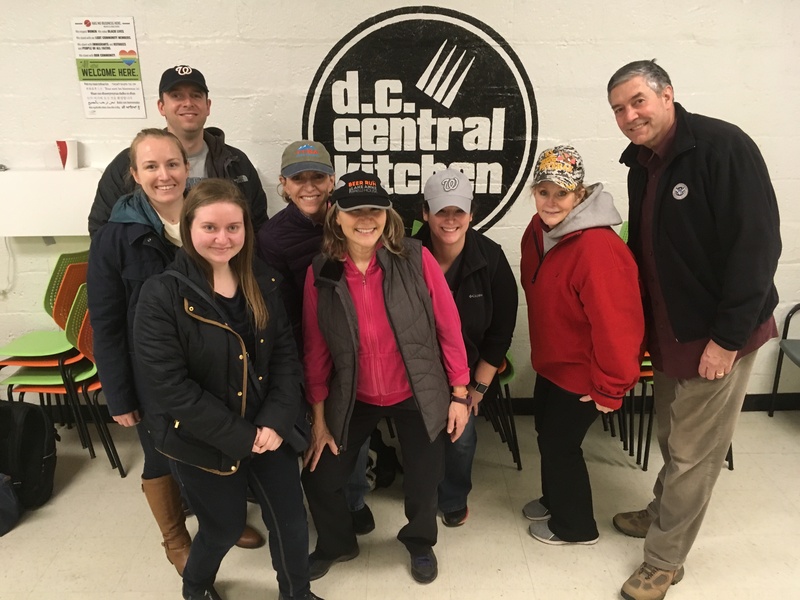 After an inspiring Round One in Washington, DC, a team of Akoyans supported the fight against hunger with a volunteer event at the Greater Pittsburgh Community Food Bank. Together, we rolled up our sleeves and in just a few hours bagged and packed an estimated 3,200 pounds of dry pasta for distribution. Special thanks and commendation goes to Ike, Roy, and Fiona, whose youthful energy helped keep the old folks in gear! The Food Bank was founded in 1980 to help families affected by the closing of Pittsburgh’s famous steel mills. Today, its reach extends across 11 counties in southwestern Pennsylvania, providing healthy food to more than 360,000 people each year — people who often have to make daily decisions about which essential items they need to sacrifice just to buy food. And well over 90,000 children in the area are food insecure, defined as having limited or uncertain access to adequate food. Consistent hunger and worrying when their next meal will be — especially in summer months when school meals are not available — impacts not only children’s physical health, but also their mental and emotional health, leaving scars that can last a lifetime. For these reasons alone, it’s clear the work of the Food Bank is far from over. Akoya is grateful for the work and commitment of the Greater Pittsburgh Community Food Bank. The team was proud to participate and looks forward to our next staff-wide volunteer event, planned for later this year. This entry was posted in Community Engagement on April 9, 2018 by Akoya. Under the leadership of Chief Creative Officer Nancy Reese, Akoya’s pro bono work with the Women’s Law Project has won a 2018 Communitas Award for excellence in company community service. 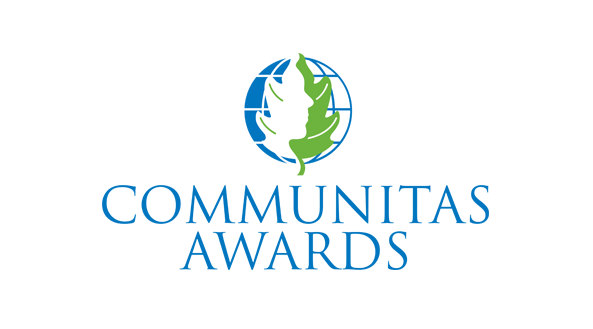 Administered by the Association of Marketing and Communications Professionals, the Communitas Awards honor excellence in social responsibility and community service among individuals and organizations. 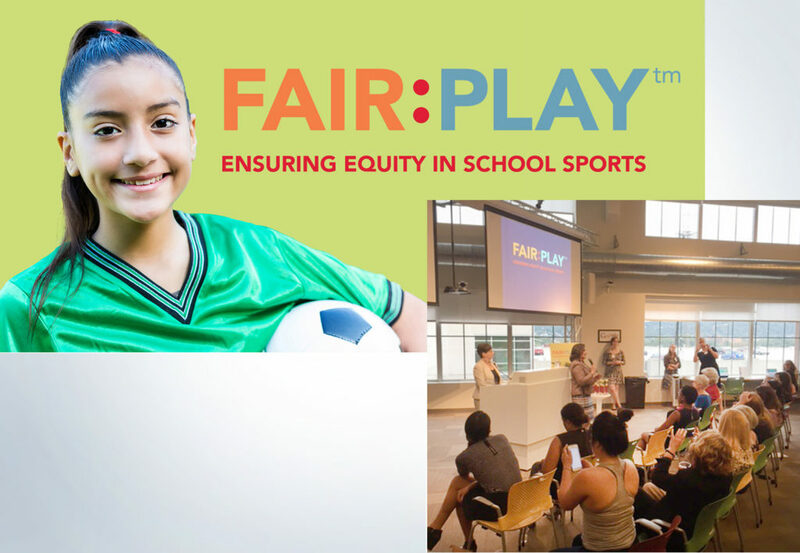 Akoya was recognized for its work on FAIR:PLAY, a website designed to help parents, students, and communities advocate for a fair share of sports opportunities for girls in Pennsylvania’s public secondary schools. The concept was born when Nancy – also a Women’s Law Project board member – identified that the Department of Education’s abundant but unwieldy raw data made it nearly impossible to determine if a school is out of compliance with Title IX law. After collaborating with WLP on the game plan, Akoya created the website’s branding and homepage design; recruited volunteer mentors, programmers, and coders (nearly all women); and, with support from the FISA Foundation, hosted a weekend-long hackathon to crunch the data and create an easy-to-use interface. And while ultimately the result was a website providing meaningful and actionable information, the hackathon itself was a remarkable STEM learning experience showcasing the region’s technical talent and the participants’ dedication to fairness and equality. 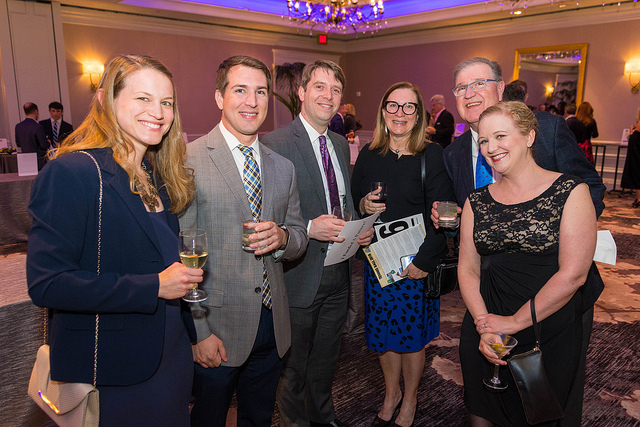 The Communitas Award is a testament to Akoya’s ongoing commitment to giving back and using its talents to help nonprofits and organizations that may not have the funding or resources to do so. We are grateful for the honor and for the opportunity to bring attention to the advocacy work of the Women’s Law Project. 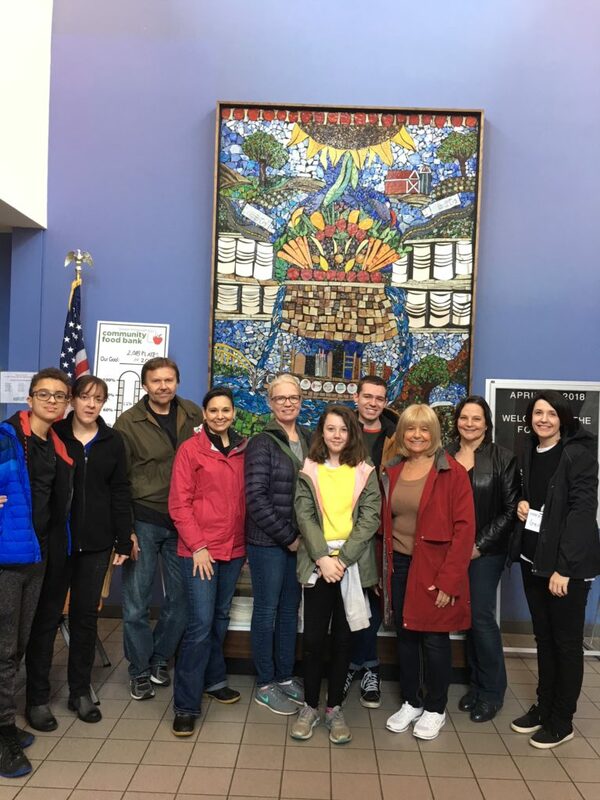 This entry was posted in Community Engagement, Our Work on March 27, 2018 by Annie Brown. 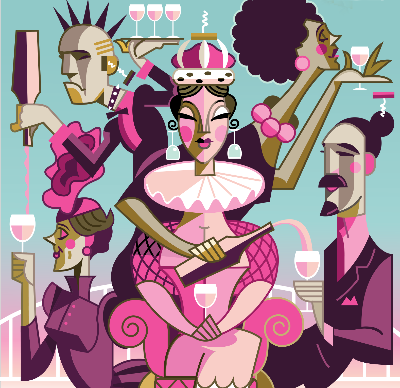 Akoyans are always happy to join the party–especially if it’s for a good cause. We love doing our part to make our hometown a better place, and we’re proud to support Riverlife in their mission to make Pittsburgh’s riverfronts cleaner, safer, and more fun for everyone. 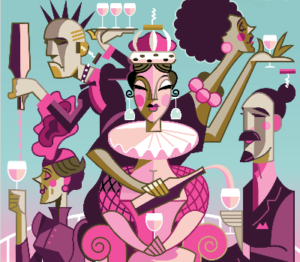 As a corporate sponsor of this year’s royalty-themed War of the Rosés fundraiser, Akoya was represented nobly by partner Genna Cavanaugh and her husband Sean, who danced, braved the waves on an Allegheny River paddleboat, and enjoyed all things pink throughout the whimsical North Shore fête. This entry was posted in Community Engagement on October 10, 2017 by Annie Brown. Too many Pennsylvania schools get a poor grade when it comes to providing equitable athletic opportunities for female students. Is your school one of them? Just a few minutes on FAIR:PLAY, a new website from the Women’s Law Project and the FISA Foundation, will help you find out. Developed by students and volunteer mentors in a February 2017 hackathon sponsored by Akoya, FAIR:PLAY crunches millions of data points reported to the Pennsylvania Department of Education through a simple-to-use tool, designed to help parents, students, and communities advocate for a fair share of health-enhancing, leadership-developing sports opportunities for girls. Akoya partner Nancy Reese introduced the web site at a launch party at Google’s Pittsburgh office on September 27. This entry was posted in Community Engagement on October 4, 2017 by Nancy Reese. Thanks to a successful capital campaign and facility expansion, Pittsburgh is now home to the largest freestanding birth center in the United States, The Midwife Center for Birth & Women’s Health. Akoya proudly supported this effort—and had the honor to help publicize the results by designing this end-of-campaign report. By raising $3.9 million, The Midwife Center (TMC) is now positioned to meet growing demand for its person-centered care in its LEED-certified facility, serving a large, diverse clientele. By strengthening its outreach to underserved communities, TMC also is better able to reduce barriers to care and improve health outcomes for women and infants in the Pittsburgh region. The quality of outcomes achieved by TMC is evident in a few key statistics. 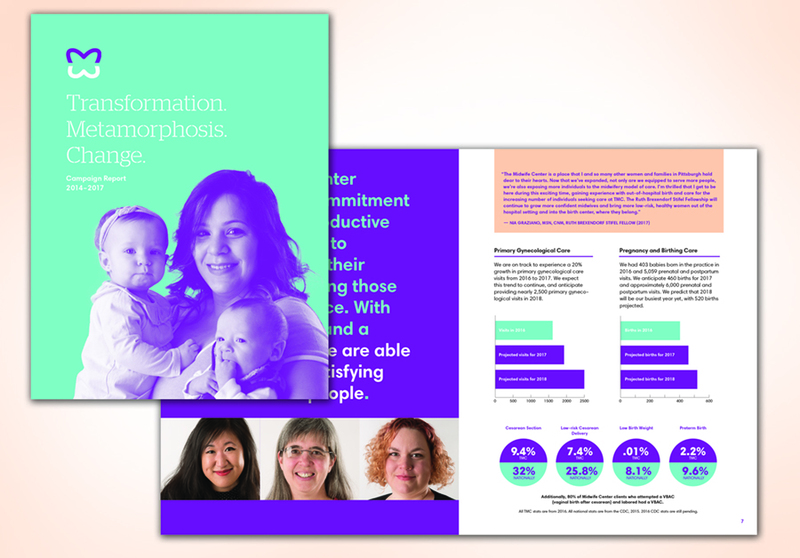 Compared to national averages, TMC has three times fewer cesarean deliveries, four times fewer preterm births, and an astonishing 800 times fewer incidents of low birth weight—a serious condition closely associated with inhibited growth and cognitive development, as well as chronic diseases later in life. With this track record, it is no wonder than TMC is emerging as a national leader in safe, personalized birth center care and is dedicated to educating future generations of midwives. This entry was posted in Community Engagement, Our Work on August 28, 2017 by Nancy Reese.